The doznaniye or inquiry is based on the frequently stated assumption that “every person who commits a crime is punished justly, and not a single innocent person subjected to criminal proceedings is convicted.” This is repeated so frequently by judges, procurators, and police that almost everyone in Moscow is sure it cannot be true. 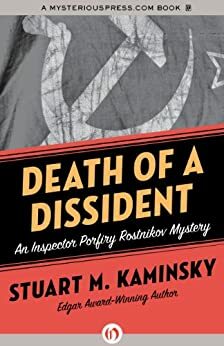 I felt a sudden longing for an old favorite author, so I thought I’d tackle Stuart M. Kaminsky’s Inspector Porphiry Rostnikov books. I’ve generally avoided this series, because the one I did read was so grim. It’s not that the writing’s bad. It’s great (as witness the dry-humored passage above), and Kaminsky’s always perceptive and humane characters are as good here as anywhere else. I just don’t like the Soviet Union. The ugliness of the architecture, the scarcity and hunger, the deadening regulations, the fear of surveillance, even the cold of Moscow – it tends to wear me down. Even when the stories are good and the characters fascinating. As they are here. Author Kaminsky decided to challenge himself to write a police procedural like Ed McBain’s 87th Precinct books, but set it in Moscow. The result is, I think, very successful (when you adjust for my prejudices). Porphiry Rostnikov, hero of Death of a Dissident, is a wounded World War II veteran (the time is the 1980s), disabled by an old leg injury, which doesn’t stop him working. In fact, he’s a weight lifter, contemplating entering an amateur competition. His subordinates are Karpo (a dedicated Marxist who looks like a vampire), and Tkatch (a young detective recently married). When a prominent dissident is murdered in his apartment two days before his scheduled trial, a suspect is quickly identified and arrested. Word comes down from above that this will do for an investigation. No further inquiry will be required. However, a seemingly connected murder that follows shortly after has Rostnikov walking a dangerous line, trying to stop a serial killer while not upsetting the political cart. A man of lesser strategic intelligence would wreck his career and perhaps lose his freedom, but Rostnikov knows his business. Good book, and people less prejudiced toward the Soviet Union than I will probably enjoy it even more than I did. There’s nothing pro-Soviet here; the anti-Communism is subtextual but ubiquitous. Nothing much in the way of objectionable material either. I so appreciate that you introduced me to Stuart M Kaminsky’s Lew Fonesca series a few years ago. I’ve gone on to read every Kaminsky novel available through my regional library consortium. I am different from you regarding books set in the Soviet Union. Solzenhitzn has long been my favorite author with his stories of life in the gulag. Yes they are dark and dreary, but he has a knack for portraying how the human spirit can rise above adverse circumstances. Having become familiar with life and culture in the Soviet Union via Solzenhitzn I have thoroughly enjoyed every one of Kaminsky’s Rostnikov novels I’ve been able to lay my hands upon. I like Rostnikov much better than the Abe Lieberman series. Years ago I read two novels set in Russia by non Russians. Gorky Park and Russia House both started like gangbusters, the great writing drawing the reader into the story. In each case I was disappointed by incredibly lame endings, unsatisfactory and illogical.